ROCHEM TANKLEEN SEPARATING is a specially formulated cleaning compound for the marine and petroleum industries. It is unique in that it cleans by dispersing oil particles rather than emulsifying them into the wash water. 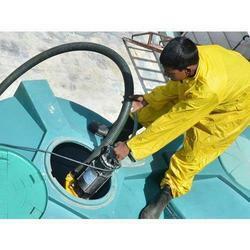 Water Tank Cleaner will help to clean your over head water tank and sump. it will remove weed, micro organism, dust stain & pigmentation etc. Tristar Engineering offers a technology of cleaning tanks using Rotary jet technology. - The slugde sucker acts like a water pump when a high pressure stream is passed through it creating a siphon and transfering a large amount of water or slurry in short period of time. Parafix tank kleen is a highly concentrated product that provides a fast, efficient and in expensive method of cleaning oil tanks. The primary objective of any tank cleaning application is to clean, maintain, and sanitize equipment at appropriate levels to prevent malfunctions or contamination that would alter the safety, identity, strength, quality or purity of the finished product. This is a concentrate Liquid solution for Over head Water Tank Cleaning, which is 100 % Bio-degradeble & Eco friendly products.